It’s a fake post circulating about D-Mart giving free voucher to celebrate it’s 17th anniversary. Please find more details at the verification section of this article. 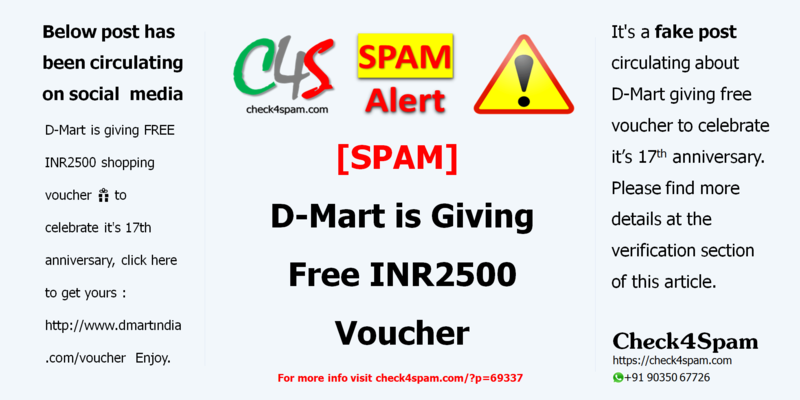 D-Mart is giving FREE INR2500 shopping voucher 🎁 to celebrate it’s 17th anniversary, click here to get yours : http://www.dmartındia.com/voucher Enjoy. Please note that the “i” of the URL dmartındia is not i but ı which is a special character. This is a trending trick used to fake URLs. The link also takes you to a page where it will ask you to share the post to 7 WhatsApp Groups or friends. Like all the other similar scams which we have reported this one may lead to automatic downloading of Malware . The Malwares can harm your phone and use your contacts and other information from your phone.